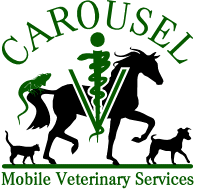 Carousel Mobile Veterinary Services was founded in 2006 because Dr. Heather and a friend wanted to provide a different option for veterinary care in South King and north Pierce counties, Washington. We work out of Black Diamond to serve our non-human friends in approximately a 45 minute radius. Our new mobile clinic is pictured below. We see dogs, cats, horses, goats, alpacas, llamas, sheep, ferrets and a few barnyard birds like chickens and ducks. Our mission is to give you the best care possible, in the most compassionate and convenient way. We try to look at the whole animal and help general health by using nutrition, herbs, behavior or environmental changes, medications and surgery. We offer comprehensive physical exams, nutritional consultations, on-site and send-out laboratory analysis, ultrasounds, x-rays, vaccinations, professional equine dentistry, field surgeries, and much more. Dr. Heather is now certified in acupuncture and has been studying herbal therapies over the years so there are many options available. All of this is done out of our mobile workstation. We offer small animal anesthetic procedures on Wednesdays, performing surgeries and dental procedures right at your doorstep now! We have a surgical laser, which has helped with pain control and recovery tremendously. We use it for all of our spays, neuters, tumor removals, amputations, etc. It also allows us to perform soft palate resections for dogs with brachycephalic syndrome. We have 2 assistants on every surgery day to help provide the best care and support for our patients. We have in-house laboratory abilities so that we can do blood work the day of surgery or we can send out to the lab if we need something more in-depth.